This post will cover the Midsummer / Litha ritual and celebration held by Circle of Fountains. 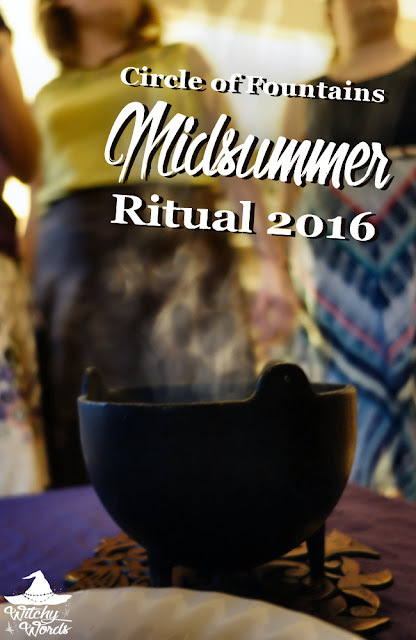 To see the Circle of Fountains 2015 Midsummer ritual, click here! 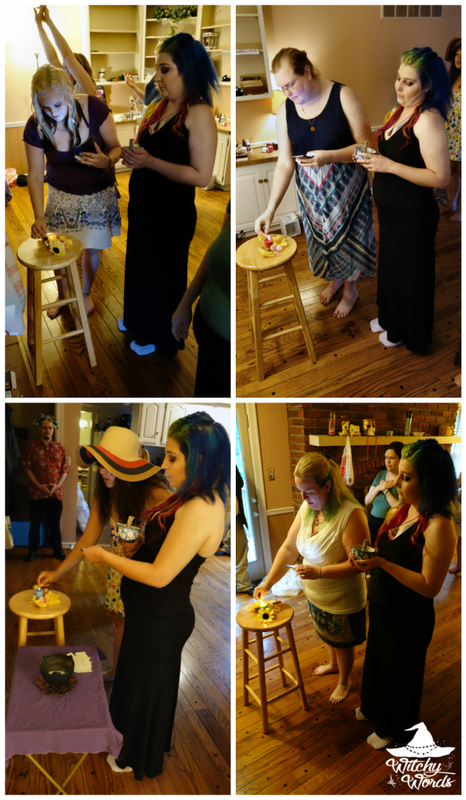 This year's solstice ritual was held by Andrea! 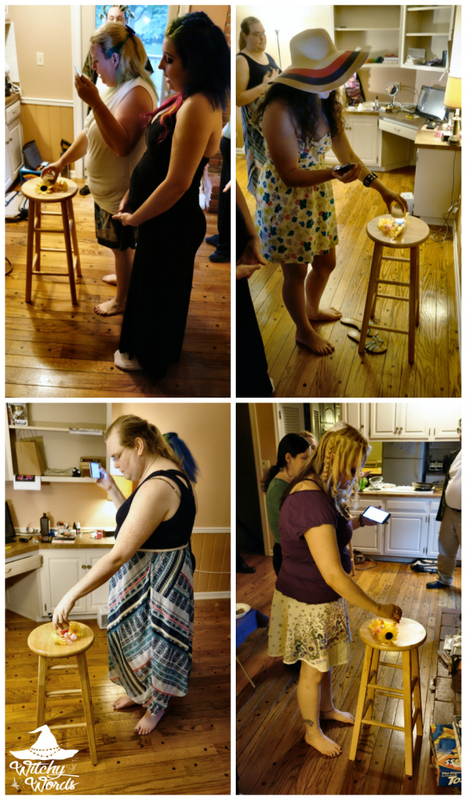 We first began ritual with our potluck feast coordinated by Circle Nutritionist Kolika. Once we finished eating, we headed to the den to begin ritual! Once the circle was open Andrea explained that Midsummer is the longest day of the year and that, hereafter, the days will only get shorter. To celebrate the coming of the dark, she had us dress half in light clothes and half in dark clothes. She also had two of the husbands wear leafy crowns to represent the Oak and Holly kings. After inviting anyone whom we wished to stand by our sides during ritual, Andrea then explained that she wanted this holiday to be about letting go of something that we've been holding back. I am filled with the light moving in the direction I need to move in, following the path that I am meant to walk. While thinking of something we wanted to let go of, we sprinkled our pinch of incense into the cauldron. We were each given the slip of paper to take home with us, thus reminding us of our oath to let go of something moving forward into the darker half of the year. To keep the ritual simple given the many stresses the members of our circle are currently facing, we closed the ritual after that. Andrea planned an amazing carnival afterward, complete with Jenga (with hidden gems! ), a glow-ring ring toss, a Tic-Tac-Toe sack toss, mini-bowling and more! I wish I had gotten pictures of the festivities but this day was incredibly hectic for me. I had a meeting with our realtor, lunch with the in-laws for father's day, the Liithi Lushede public ritual and our ritual. I was utterly exhausted and it showed - not that the circle would let me get away with sleeping for too long! Despite the many challenges we're currently facing - two of us moving, one in medical school, one starting a bakery, four dealing with severe health issues, a couple dealing with career problems and more - we've become an incredibly strong family and support network. I don't know what I'd do without my circle! I love them to pieces. From my circle to yours, I hope you had a fantastic, sunny solstice! I love the picture of everyone sitting on top of you! Sorry to hear that the circle members are having some issues, so I'll send lots of good thoughts to you all. The carnival looks like it was a lot of fun! I didn't do anything elaborate for solstice since I'm solitary (and it's my first litha, I think I've said before I'm new to all this) but I did get up at sunrise to say good morning to the sun and then said goodnight and thank you at sunset. Anyway, happy belated summer solstice! Thank you so much, Liz! I think you did plenty for Midsummer. Before the circle, my solitary practice was very similar. I had a tradition of sleeping in on Yule and waking up at sunset and staying up with the lights off until sunrise. No ritual, no spell work. Sometimes the simplest things are the best way to honor the holiday! Happy solstice to you as well!